Dane Monday deals with weird stuff. Mad scientists, sorcerers, robots, time-travelling cats, cyborgs learning the concept of love, and more. 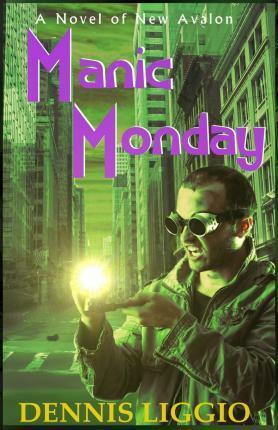 Whether it's a death ray, a doomsday ritual, or simply magic gone wrong, Dane Monday is there to stop them. He's even got a rogue's gallery of megalomaniacal villains who want revenge. Armed only with his wits, some reluctant allies, and a satchel full of gadgets, Dane steps forward to save the city of New Avalon. While investigating an abandoned building, Dane encounters the remnants of a magical ritual shortly before the building explodes in spectacular fashion. Narrowly escaping this destruction with his new ally, the aspiring journalist Abby Connors, Dane follows the threads of this mystery while evading a menagerie of homicidal robots, kidnapping thugs, and the wrath of a mad scientist. At the bottom of it all is a scheme to destroy New Avalon involving a century-old architect, a historic hotel, and something not of our world. Can Dane and Abby brave the dangers and the strangeness to save the city of New Avalon? Find out in Manic Monday!